Help. The Steam beta client is an altered beast today, in a hundred small ways. It’s disorientating, as if somebody has changed the colour of all our toothbrushes, or relocated the cereal cupboard an inch to the left. Let’s try and get our bearings, shall we? 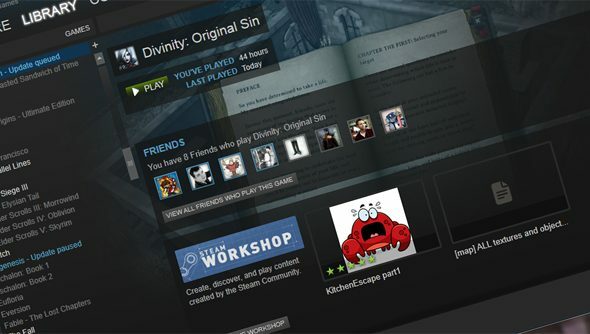 It’s now possible to hide games from your Library – a tool for those who would prefer to pretend they never did buy Sacred 3. To do that, you’ll want to head to the Set Categories menu for the offending game and tick the appropriate box. Hidden games won’t show up in library filters – but they will still be playable, and appear on your profile. So there’s no getting away from the embarrassment. Valve say they’ve simplified control and navigation in the Steam client, and “neutralised” its colour palette to bring it closer to the aesthetic of Steam’s site and Big Picture mode. Have you lot spotted anything else?